We’d love your help. Let us know what’s wrong with this preview of For Better or for Best by Gary Smalley. To ask other readers questions about For Better or for Best, please sign up. To quote Friends: it's not that [the book] is bad. It's - it's that [it's] so bad it makes me want to push my finger through my eye, into my brain, and swirl it around. This book is so demeaning towards woman. It also says that manipulation is not manipulation if it's for the man's good. But actually, manipulation is manipulation. How about I tell my husband that what he's doing is hurting me and he listens because he loves me? This was a frustrating, disturbing read. My counselor recommended I b To quote Friends: it's not that [the book] is bad. It's - it's that [it's] so bad it makes me want to push my finger through my eye, into my brain, and swirl it around. 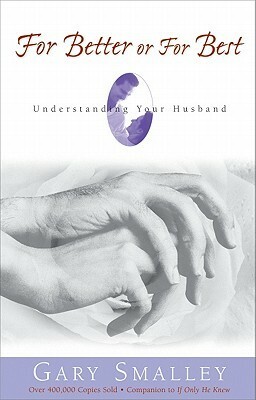 This book is more about manipulation techniques rather than helpful marriage and communication principles. It made me cry, it made me nod my head furiously...but most of all, challenged me!!! As a very headstrong, outspoken wife of a very laid back and timid husband, we find ourselves at odds often. But this ball put the ball in my court and showed me how I was messing up disastrously in many areas of our marriage as well as my high expectations of my husband. I can't tell you how many times I bawled through chapters just hoping that my tears were not founded in conviction...well they surely were. Tha It made me cry, it made me nod my head furiously...but most of all, challenged me!!! This book is horrible. Only a few good points about how men deserve to be respected and praised. The rest is simply about how to manipulate your husband into doing the "honey do list". there are much better books out their on how to love and appreciate your husband without having to read on "keeping yourself fit because it is important to maintain attraction so your husband does not get bored" and "how no husband wants a depressed and unfit wife." Overall an enlightening read for wives or anyone wanting to love and respect a man better. A lot of practical and straightforward ideas set within a Christian worldview (although I think anyone who desires to live a good life and have healthy romantic relationships would find this book to give helpful advice). I most appreciated Smalley's emphasis on personal responsibility: marriage is hard work and you can do quite a bit yourself to improve problem areas and strengthen love. You can tell the b Overall an enlightening read for wives or anyone wanting to love and respect a man better. A lot of practical and straightforward ideas set within a Christian worldview (although I think anyone who desires to live a good life and have healthy romantic relationships would find this book to give helpful advice). I most appreciated Smalley's emphasis on personal responsibility: marriage is hard work and you can do quite a bit yourself to improve problem areas and strengthen love. Probably the best book on marital relationships I have ever read, and it really helps. This book was recommended to me by a woman who almost left her husband, but changed it by reading Gary Smalley's books. I love his biblical approach to changing your relationship for the better with your husband. I highly recommend it! It really teaches about the difference between the way women percieve what men do and what men are actually doing. It clarifies a lot, expecially if you have no idea what is going on in your husband's mind or if he just drives you crazy (in good and bad ways). It really showed me where he was coming from. Lots of practical information. Lots of things sounded good and increased my understanding of the way men think. Just not sure how much I'll try and put into practice. The last chapter in itself was great. The best thing I took from this book? Happy families are camping families. If you have problems understanding men, THIS is the book to read. This book brought my fiance and I so much closer together. It helped me to understand his needs and how I could help him in his wants. Blerg. Started out as a good read but quickly became a typical ultra conservative viewpoint of marriage & the role of wifey to nurture & elevate her hubby while lowering her expectations & removing part of her brain so she can have a happy & satisfying marriage. Gary Smalley really has done his homework on relationships and how woman can turn theirs around. When these principles are applied, you will get results. Even the most hard headed prideful man will melt. Has some hokey old "Leave-it-to-Beaver" stuff, but I liked finding out that "Men are buffaloes; women are butterflies." I felt like the book kinda said men were jerks, though. Luckily, I don't find that that's the case with my fiance, David. how to be more patient with my fiance. to understand his needs and to have him fulfill mine without arguement. i've also learned many things that i do that are upsetting to him. Gives some thoughts on how to understand and relate with one's spouse. Good book with a lot of good information. I didn't like how the author seemed to assume that the woman would be stay at home. One of the very good resources my wife and I use when we counsel with couples regarding their marriage. Reading this for a Bible study/book group. Just started. I like Gary Smalley, though. Very Accurately written, our pastor had us read this book before we were married. Interesting... Probably won't be re-reading this one. Wonderful book! I recommend this to anybody who was, is, or hopes to be in a relationship at any point in their lives! Great book! I got some work to do. GOOD!!! Very good. I recommended to all of you if you want to simplify your heart. (for woman). This was a great book. By just applying a few things I found in this book it has done transformed my husband and I's marriage. Would recommend to every married woman. I just LOVE that book ! I bought it last week and I have already learned SO MUCH. I'm not even married yet, but as a single woman in a relationship, it is very helpful. Thank you Gary ! Gary Smalley was one of the country's best-known authors and speakers on family relationships. He was the award-winning, best-selling author or coauthor of sixteen books, as well as several popular films and videos. The Blessing and The Two Sides of Love have won Gold Medallions, The Language of Love won the Angel Award as the best contribution to family life, and his other titles have received Si Gary Smalley was one of the country's best-known authors and speakers on family relationships. He was the award-winning, best-selling author or coauthor of sixteen books, as well as several popular films and videos. The Blessing and The Two Sides of Love have won Gold Medallions, The Language of Love won the Angel Award as the best contribution to family life, and his other titles have received Silver Medallions. His national infomercial Hidden Keys to Loving Relationships has been viewed by television audiences all over the world.